There’s a lot of damage out there from the Dec. 11 storm; here’s a scene that greeted our crews in the Shady Lane area of Lacey. 9 a.m. update: Crews are deploying generators as we wait for power to come back up in several areas. Original post: Comcast crews are out there in the darkness as we post this, working to repair damage from a significant windstorm. As always, those of us indoors are hoping everyone stays safe: the crews, and you and yours. We will post more updates as the day goes by. This is something you don’t see every day; a 61-year-old tech in Clearview with the most seniority on his team shows how you can climb a pole Friday morning, using proper safety precautions, with hooks. Here’s some information to have about how we have to approach storm damage: When storms arrive, our crews assess where the damage is worst and do what we can to preserve the network. We cheer on the power crews, because they have to go in first to make the scene safe. We will often deploy generators, and we are deploying a lot of them today, to help keep the network going in areas surrounded by outages. We wait until electrical crews have completed their repairs and make the area safe before we and other people with lines on the poles can move in and begin our work. At all times, the goal is to keep everyone healthy. In 99 percent or more of the time, when your electrical service is restored, your Xfinity services will come right back up. In some cases, it’s good to perform a powercycle to clear the equipment. If your service is still not working, that could be because of storm damage that you, and therefore we, did not know about until now. And of course that’s very frustrating, because all you the customer knows is that you had to wait just to get power back up. We are grateful for your business and your patience after storms like this one. We’re out there, fixing where we can, and hoping the wind dies down everywhere! Oh, you may have seen this program, but if not, KIRO gave everyone a glimpse into a room that’s hopping right now. 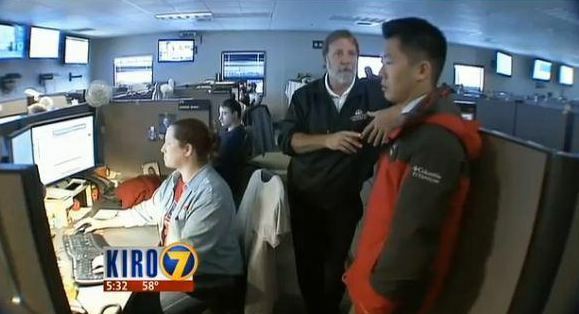 The monitoring station in Everett tracks signal strength and other issues throughout Washington. You can see it on a calmer day from the newscast below. You can click on the screenshot for a link to the story and video.